Nestled amongst the huge cities like Birmingham and Coventry, Warwickshire offers something different. Each of the townships have their own particular, distinct personality. But what they all share in common, is an appreciation of a good party. The festive season is fast approaching and with it, the Christmas party as well. The highly anticipated Christmas party is the biggest event on any social calendar and our Christmas party packages are extremely popular with corporates from companies and businesses within the area. Of course though, our Christmas parties aren’t just for corporates! Our parties are attended by all kinds of groups; those from clubs, organisations and groups of friends who would like to go all out and do something special this year in Warwickshire! We understand that planning the Christmas party can feel like a chore, but if you’ve been tasked with the role of it this year, then never fear, as that’s where Eventa comes in! Our handy and easy to use Christmas party packing finding service is quick and will provide you with all the available Christmas parties in your location as listed by our trusted venues. Ready to find your perfect Christmas party night? Take a browse of our fantastic options in Warwickshire and send an enquiry through today! Did you know that The Italian Job's car chase scene involving Minis was filmed in huge sewer pipes at Stoke Aldermoor, Warwickshire in September 1968? Warwick is host to some magnificent hotel venues which are this year offering some incredible festive party nights that you and your group will love! From themed events to traditional dinner and dances, you can guarantee that your guests will experience an unforgettable night, which will be talked about time and time again! Before you decide what kind of Christmas party theme you’d like to go for in Warwickshire, then we suggest deciding whether a shared or exclusive party night would be best for your group. 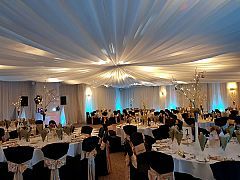 Our listed venues in Warwickshire offer a great selection of both, but if you’re not too sure how these party types differ, then read on as we explain this further for you. A shared party night, also known as a ‘joiner party’ is ideal for those small to medium sized groups who would like to come together with other groups from the area to enjoy all the fun of the festive season. The atmosphere at a shared Christmas party night is just electric, and you’ll enjoy a delicious meal and some top entertainment during your event. Some shared Christmas parties also include drinks on arrival or with dinner, so take a browse of our available party options and see what takes your fancy! As for exclusive Christmas parties, these events are preferred by big groups with larger budgets, or simply just those groups who are seeking some privacy for their festive celebration. The event space will be totally private, meaning that you won’t have to share with anyone outside of your company. Generally, exclusive parties are a lot more intimate, so if you’d like to include an awards ceremony after dinner or do an end of year speech, then the fantastic events team at your chosen venue will be happy to speak to you about any ideas you may have. Let Eventa make your search for your perfect Christmas party an absolute doddle!